Create a bestover with stale bread. A delicious way to reduce food waste! 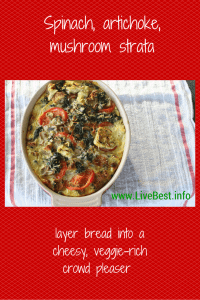 Spinach, artichokes, mushrooms and cheese = Spinach Artichoke Mushroom Strata! A make-ahead breakfast casserole. Have some dried out bread? A strata is a great way to repurpose it. Strata means layers. This is layers of bread cubes, vegetables, cheese all mixed up with an egg mixture. It’s like a savory bread pudding. Similar to a frittata. 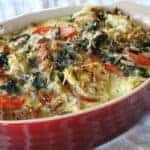 Spinach Artichoke Mushroom Strata, a bestovers make-ahead breakfast casserole. The best things is that you can use about any cooked vegetable you have on hand – broccoli, spinach, onion, kale, or peppers. Artichokes and mushrooms were the cupboard castaways I had on hand. Together with leftover sourdough bread, this hearty strata made dinner easy and inexpensive. I had garlic dill cheddar on hand, which was a good fit for the other ingredients and boosted the flavor. Go ahead and shop your fridge for cheese that’s waiting to be used. A blend of cheeses would be great. A hearty bread works best in this baked dish. Think of sour dough, Italian bread, ciabatta, or a heavier grain-based bread that will hold up with the egg mixture. A soft white bread will turn mushy. If the bread’s a little dry or stale, even better! This recipe is flexible. If you have chives, use those instead of dried onion. Other fresh herbs would be a great addition such as basil, thyme, or parsley. As you can see, this is a forgiving recipe. For breakfast, brunch or dinner, it is an ideal way to make something out of nothing into bestovers. I love repurposing food. Here are more recipes and ideas. And that’s why I like it. Hope you do too! Create a bestover with stale bread. 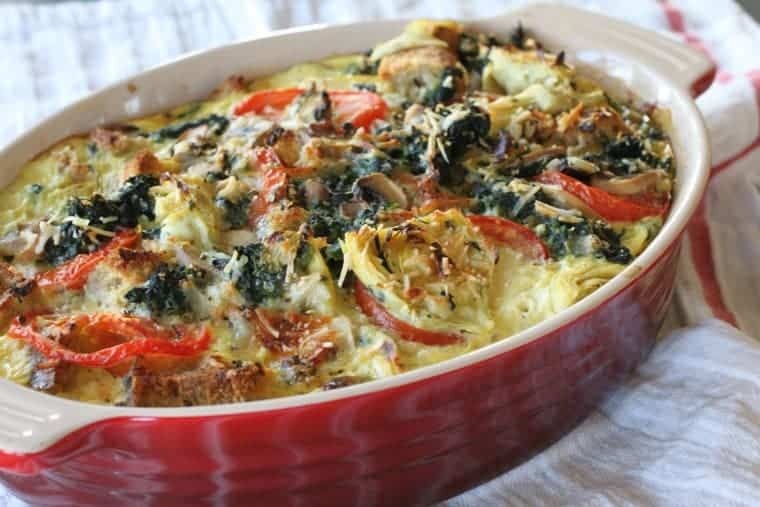 Spinach, artichokes, mushrooms and cheese bake into some kind of delicious Spinach Artichoke Mushroom Strata! Spray a 9 x 11-inch pan lightly with cooking spray. Cook spinach according to package directions. Allow it to cool so you can handle it. Squeeze moisture out by wrapping in a cloth towel and squeezing or by squeezing small handfuls. 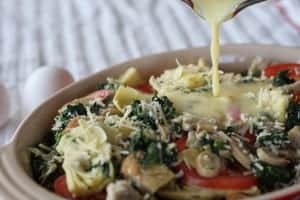 In a large bowl, combine spinach, artichoke hearts, mushrooms, bread cubes, dried onion and shredded cheese. Scoop into prepared baking dish. Place tomato slices over mixture then sprinkle Parmesan over top. In a small bowl, whisk together milk, eggs, mustard, cayenne, salt, pepper and nutmeg. Pour egg mixture over bread mixture. Bake in oven 45-50 minutes, until set and lightly browned.